A group of Benedictine oblates and affiliates based in and around Oxford. 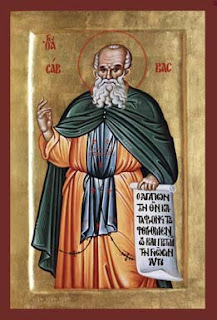 St Sabbas, a celebrated anchorite of the fifth century, organized monastic communities in Palestine and founded, among others, the celebrated monastery which bears his name. He died in 531 at the age of ninety four. Os justi meditabitur sapientiam, et lingua ejus loquetur judicium: lex Dei ejus in corde ipsius. * Noli aemulari in malignantibus: neque zelaveris facientes iniquitatem. The mouth of the just shall meditate wisdom, and his tongue shall speak judgement: the law of his God is in his heart. * Be not emulous of evildoers: nor envy them that work iniquity. Intercéssio nos, quaesumus, Dómine, beáti Sabbae Abbátis comméndet: ut, quod nostris méritis non valémus, ejus patrocínio assequámur. May the intercession of the blessed abbot Sabbas, we beseech Thee, O Lord, commend us unto Thee, that what we cannot have through our own merits we may obtain through his patronage.